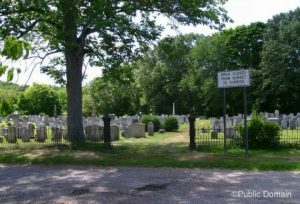 One of Connecticut’s best-known ghosts haunts the Union Cemetery in Easton. The cemetery sits beside the centuries-old Easton Baptist Church near the intersection of Routes 59 and 136. The locals call the ghost “The White Lady,” and she has been seen by dozens of witnesses since the mid-twentieth century. The legend of The White Lady contains several explanations about who she was and how she came to haunt the cemetery and nearby Route 59. One account says she was buried in the cemetery after she died during childbirth, and her confused spirit is desperately looking for her child. Two other versions say she was the victim of foul play. She was either murdered near the turn of the twentieth century and her body was thrown down a sinkhole behind the church, or her husband killed her sometime in the 1940s. 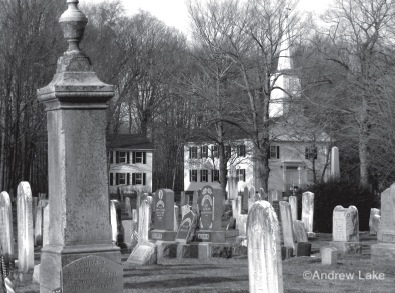 Though her ghost has been seen moving about the cemetery late at night, most encounters take place on Route 59. The White Lady has a habit of appearing directly in front of people’s cars as they drive by the Union Cemetery, causing them to break hard and swerve to avoid impact. Any driver who has stopped to make sure the woman is all right finds no one around. A local fireman driving by the cemetery one night thought he struck a dark-haired woman in a white dress, who had walked right out into the road. Not only did this man feel the impact, he also discovered a dent on the hood of his vehicle. A search of the area turned up nothing. Ed Warren told Belanger that at about 2:40 a.m., he heard the sound of a woman weeping in the cemetery. When Warren looked out into the field of headstones, he could see little points of light coalescing into the shape of a woman. This female form then began to move in his direction. Being the fearless ghosthunter that he was (Ed passed away in 2006), Ed tried to walk towards the specter, but as he did so, it dissipated and vanished from sight. Belanger said the video recording captured what looked like “a misty white form” taking shape into the outline of a human. The form then moved several feet through the graveyard before it faded into the ground by the front gates. The Union Cemetery is closed after sunset, and the police do take notice of trespassers. So, if you do go for a visit, please be respectful.